Cape Canaveral, Fla. (AP) – The world’s nights are getting alarmingly brighter – bad news for all sorts of creatures, humans included. The observations, for example, indicate stable levels of night light in the United States, Netherlands, Spain and Italy. But light pollution is almost certainly on the rise in those countries given this elusive blue light, said Christopher Kyba of the GFZ German Research Center for Geosciences and lead author of the study published in Science Advances. Also on the rise is the spread of light into the hinterlands and overall increased use. The findings shatter the long-held notion that more energy efficient lighting would decrease usage on the global – or at least a national – scale. Kyba and his colleagues recommend avoiding glaring lamps whenever possible – choosing amber over so-called white LEDs – and using more efficient ways to illuminate places like parking lots or city streets. For example, dim, closely spaced lights tend to provide better visibility than bright lights that are more spread out. The International Dark-Sky Association, based in Tucson, Arizona, has been highlighting the hazards of artificial night light for decades. An instrument on the 2011-launched U.S. weather satellite, Suomi, provided the observations for this study. A second such instrument – known as the Visible Infrared Imaging Radiometer Suite, or VIIRS – was launched on a new satellite Saturday by NASA and the National Oceanic and Atmospheric Administration. 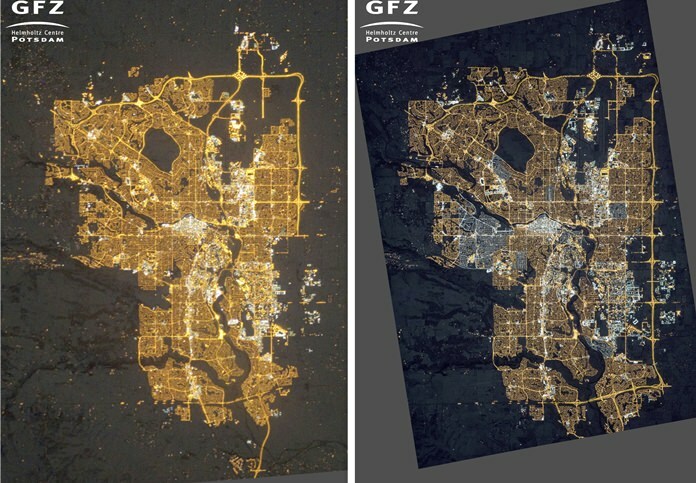 This latest VIIRS will join the continuing night light study.